Type Locality Niamkolo, Zambia, Lake Tanganyika. Etymology The generic name comes from the Greek phyllos, meaning leaf and nema, meaning thread, in reference to the distinctive barbel shape of the type species Phyllonemus typus. The specific epithet means form in Latin. Identification An upper body colour of brown-maroon with a cream coloured belly. Easily distinguished from the rarer P. filinemus by the small spatula-shaped endings on their maxillary barbels. Sexing The male is larger and more strongly built than the female. The female may also be plumper when viewed from above. Distribution Endemic to Lake Tanganyika. Other Parameters A pH in between 7.8 and 8.2 is best suited to aquarium husbandry. Feeding Will readily take most prepared foods. Its diet should be supplemented with live foods from time to time. In the wild, its diet has been shown to consist of very small fish and larval insects. Furniture Prefers rock work over driftwood or plants. Will make its home in small crevices. Compatibility A very peaceful fish which may be out competed for food and picked on if kept with much larger, more aggressive fish. A model citizen except for its large mouth which means it can and will eat smaller fishes. Should be kept in a group, since it is a fairly social fish and will be emboldened by the presence of conspecifics. Breeding According to Ochi et al, 2000, P. typus is a biparental mouth brooder. Male and female form a strong pair bond before mating and caring for young, with the male and/or female incubating and hatching the eggs in their mouth. 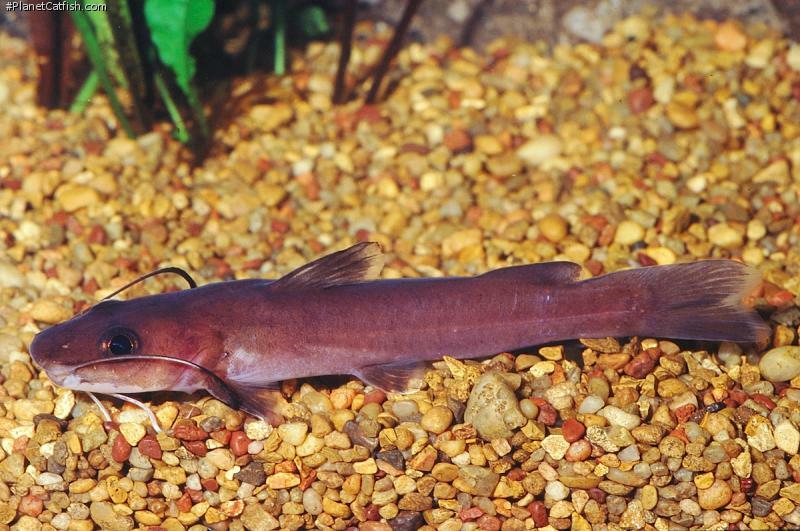 Ochi, H., A. Rossiter and Y. Yanagisawa, 2000 The first record of a biparental mouthbrooding catfish. J. Fish Biol. 57(6):1601-1604. Bailey, R. M., and D. Stewart, 1984 Bagrid Catfishes from Lake Tanganyika, with a Key and Descriptions of New Taxa. UMMZ, Ann Arbor. Eccles, D.H., 1992 FAO species identification sheets for fishery purposes. Field guide to the freshwater fishes of Tanzania. FAO, Rome.